KEY ISSUES Context. The Zambian economy has performed well in recent years, with strong growth and modest inflation, and has high growth potential. The government has resolved to step up development by scaling up investment in infrastructure. However, this year has seen a significant loosening of fiscal policy, leading to a large fiscal deficit. Outlook and risks. Assuming front-loaded fiscal adjustment toward a sustainable deficit, growth is projected to remain strong at 78 percent and inflation to decline gradually to 5 percent over the medium term. Key risks to the outlook are the uncertainties about fiscal policy and the broader business environment, and a possible slowdown in emerging markets and its impact on copper prices. Fiscal stance. The current fiscal stance is unsustainable. 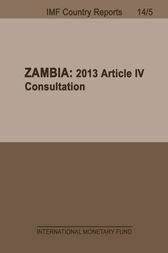 To improve Zambia's fiscal position, fundamental reforms are required to contain the wage bill and recurrent expenditures, boost domestic revenue, and create fiscal space for infrastructure investment. Staff recommended reducing deficits to 5 percent of GDP in 2014 and gradually to 3 percent over the medium term, and bringing down net domestic financing to 1½-2 percent of GDP to avoid crowding out the private sector. Public financial management (PFM). To support fiscal consolidation, PFM reform needs to be stepped up. Investment planning and implementation also need to be strengthened to support planned scaling up of capital expenditures, and debt management strengthened in light of the increasing reliance on non-concessional financing. Monetary policy. Given the low level of international reserves, the Bank of Zambia (BOZ) should allow more exchange rate flexibility and continue to build up reserves in line with their medium-term target. BOZ also needs to continue to tighten monetary policy to contain inflation. Competitiveness. Over the last decade, Zambia's competitiveness has been boosted by strengthened macroeconomic fundamentals and a favorable business environment. However, a series of recent regulations have raised questions about the policy direction, and high minimum wages could hamper the country's competitiveness, job creation, and economic diversification.